Welcome to our 2015 Rare Book Fellow! 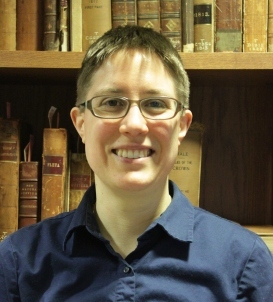 The Lillian Goldman Law Library welcomes Anna Franz as its 2015 Rare Book Fellow. Anna is our second Rare Book Fellow. She earned a Master’s in Library & Information Science from Wayne State University. She has a Ph.D. and M.A. in Medieval Studies from the University of Toronto, where she also taught Latin to graduate students. Her dissertation, “Agobard of Lyon: An Exploration of Carolingian Jewish-Christian Relations,” displays her mastery of early medieval law. Anna’s training in canon law, and her skills in Latin, will be put to good use as she develops a research guide for the library of the Stephan Kuttner Institute of Medieval Canon Law, which is now on deposit in the Yale Law Library. In addition, for the next six months she will be involved in all aspects of special collections librarianship in a research law library, including collection development, reference, cataloging, and preservation. The Yale Law Library Rare Book Fellowship is designed to train the next generation of rare law book librarians. We are delighted to add Anna to their ranks.